Do you appreciate how much it cost to give you a gift of God's Word, the Bible? Ultimately, you have God to thank, for putting this gift together, over hundreds of years, and besides the blood Jesus shed for you and me, and every other believer, a number of martyrs have given their lives to see that God's Word was translated and put into the Bible - which eventually came into your hands in a way you could read. Awesome! Isn't it just awesome to hold a gift of God's Word in our hands? But there are countless people longing to receive this gift, and many more that have no idea that God has prepared such a fine, everlasting gift as this one. Isn't it embarassing to realize we are hording a priceless gift, meant for all of them too? 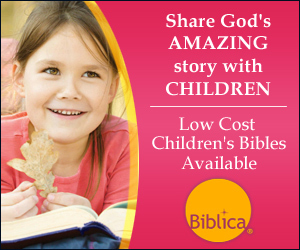 Biblica is one organization that has been providing Bibles since 1809, to sailors, soldiers, pioneers, housewives, missionaries, teachers, pastors, even (indirectly) to children in Sunday Schools. Of course, as ordinary believers such as you and I, desire to bless others with a gift of God's Word, we are part of this divine plan for spreading the gift to all who should have it. Incidentally, my friend Maria, (originally from Portugal) is one special woman who has been transformed by reading the Bible, and she is often running off to the bookstore to buy another one for someone she has just met. So, has it occurred to you yet that you might be giving Bibles as gifts? Christmas is ideal, but hey - any time of year - or for no reason at all, except great compassion, it is appropriate to give a gift of God's Word. Try this idea on for size; how about donating a whole case of Bibles? Biblical sells them by the case, (which really brings down the price per copy!) and they have a program called Scripture Outreach. Via Scripture Outreach, and donations from believers like you and me, they are able to use creative channels - and different formats to circumvent barriers of a cultural, or political nature, to get Bibles into the hands of people who are hungry and thirsty for the Living Bread and Water of God's Word. Biblica is already doing this in print, audio, and online mediums - in at least 100 languages! Wow! Let's pause to absorb that! Biblica makes it real easy for us to have a part in this. Simply go to their website .BiblicaDirect.com; place an order for a case or two - or more - of Bibles, in the language and area where you have a special passion and concern for the people. If you are really partial to children's ministry, you can specify that you want your order to go to children. The same applies if you are burdened for those who are visually impaired, or those sitting in prisons (with plenty of time to read!). What about those in the military? Or new mothers? 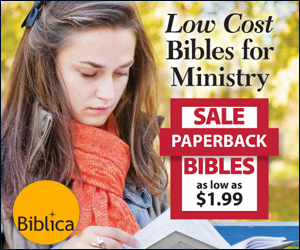 You know, I think you should browse around the Biblica site, and see if you don't get inspired for more gift ideas there. However, if you can possibly afford it, I would recommend paying for a case of Bibles to be passed on. If not, could you manage just one Bible for someone that you want to bless with a gift of God's Word? You know, that new believer who needs to be grounded in God's love and laws. But then many unbelievers who got their hands on a Bible, have testified that it led them to faith in Christ. It is so much Alive and Powerful!